Julie Dirkson knows a thing or two about learning. Well versed in the research, she is especially good at bringing ‘behavioural psychology’ to the foreground. Understand learners and you understand why it is so difficult to get them to learn. So it was a pleasure seeing her speak and speak with her afterwards. 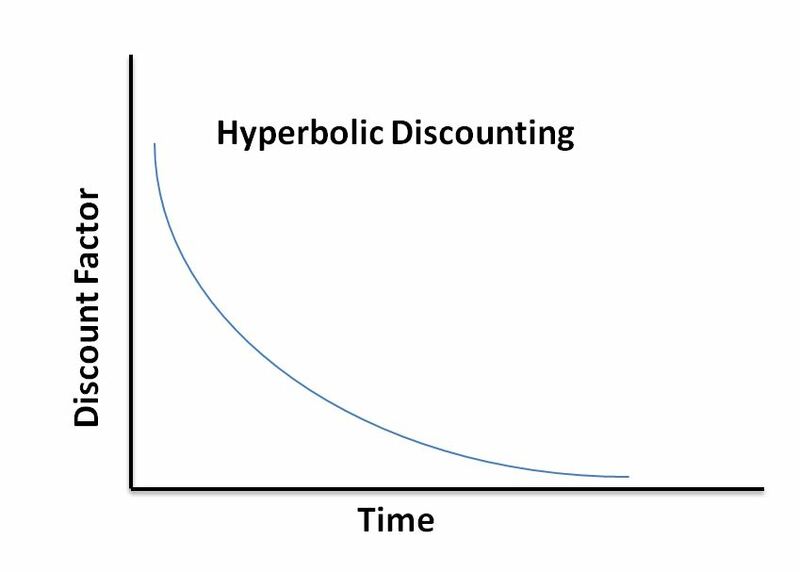 One cognitive bias that is hits learning hard is that of hyperbolic discounting, a well researched feature in behavioural economics. Take two similar rewards, humans prefer the one that arrives sooner rather than later. We are therefore said to discount the value of the later reward and this discount increases with the length of the delay. If the consequences of our learning are distant, we are likely to take it less seriously. Smokers don’s stop smoking just because you tell them it’s dangerous, and there’s no greater danger than death! In practice, smokers see the consequence as being some time off, so they don’t stop smoking just because you warn them of the consequence. So it is with learning. Rewards feel distant in learning, which is why students tend to leave study and cram just prior to exams, or write essays on the last night. They are not committed when it is likely that they won’t use their newly acquired knowledge and skills for some time, if at all. No one would watch a printer problem video unless they had a printer problem. So how do we get the learner to be a rider and not be stopped by the elephant? Reframe learning into a more social experience, online or offline, so that learners have their peer group to compare with. If you see tat others are doing things on time, you are more likely to follow than be presented with some distant consequence. Future promises of promotion, even money, have less effect that near experiences of being part of a group doing things together or being encouraged, even peer reviewed, as encouragement and feedback engenders action. Give people control over their learning as personal agency acts as an accelerant. If I feel that things are not imposed upon me, but that I have chosen to take action, then intrinsic motivation will, on the whole, work better than extrinsic motivation. Giving people the choice over what and when they learn is therefore useful. Just in time training, performance support and workflow are all terms for delivering learning when it is needed. This closes the gap between need and execution, thereby eliminating hyperbolic discounting, as there is no delay. Otto is a chatbot that sits in Slack, Messenger, Microsoft teams of whatever social or workflow system your organisation uses. It provides a natural language interface to learning, when you need it. A sense of immediacy can be created by events – a merger, reorganisation, new product, new leader. All of these can engender a sense of imminence. Or manufacture your own mini-event. Several companies have implemented ‘phishing’ training by sending fake phishing emails, seeing how people react and delivering the training on the back of that event. Almost everything you do online – Google, Facebook, Twitter, Instagram, Amazon and Netflix, use recommendation engines to personalise what the system thinks you need next. Yet this is rarely used in learning, except in adaptive systems, where AI acts like a teacher, keeping you, personally on course. These systems are not easy to build but that do exist and is another example of AI in learning. Online learning needs to pick up on contemporary UX design and use slight movement, colour changes, positioning and layout to push people into action. In WildFire we use AI to create extra links during the learning experience. These appear as you work through an idea or concept, and are highlighted of the system thinks you didn’t really get it first time. But there’s lots of things you can do to nudge people forward in learning. A neat combination of events as catalysts, nudge learning and calls to action, used widely in marketing, was a project by Standard Life. They used a merger with another large organisation as the catalyst, short 90 second videos as nudges and challenges(calls to action) to do something in their own teams as calls to action. Use was tracked and produced great results. Calls to action are foundational in marketing, especially online marketing, where you are encouraged to contact, registered, inquire or buy through a call or button. Have a look at Amazon, perhaps the most successful company in the world, built on the idea of calling to action. Habitual learning is difficult to embed, but once adopted is a powerful motivator. good learners are in the habit of taking notes, always having a book in their bags, reading before going to sleep and so on. Choose your habit and force yourself to do it until it becomes natural, almost unthinking. In Kahneman language you must make sure that your System 2 has some of the features of what were once System 1. Or your elephant starts to get places on its own without the rider urging it along. Learning is one thing, getting people to learn is another. Psychologically, we’re hard-wired to delay, procrastinate, not take learning seriously and see the rewards as far too far down the line to matter. We have to fight these traits and do what we can to encourage authentic and effortful learning, Make it seems as though it really does matter through all sorts of nudges; social, autonomy, push, place in workflow, events as catalysts, recommendations, visual nudges, recommendations, calls to action and habits.